A pre-feasibility study was completed on the Worcester Project to determine the economic viability of mining the Mineral Resources delineated to date below the old mine workings. The study investigated the viability of applying low cost, bulk mining methods to the Indicated Mineral Resources situated between 210m and 560m below surface. The steeply dipping Worcester mineralised zone, which contains free-milling gold, is amenable to mechanised mining by means of continuous retreat open-stoping. Based on the mine design, and after applying appropriate economic and modifying factors, an Ore Reserve of some 1.4 million tonnes at a grade of 3.01 g/t (equivalent to 133,000 oz) can be mined over 10 years at a production rate of 150,000 tonnes per year. Although results of the pre-feasibility study indicate that the project has an IRR of 24%, the proposed mining operation is not regarded as being sufficiently robust to justify a more detailed engineering study at this stage. 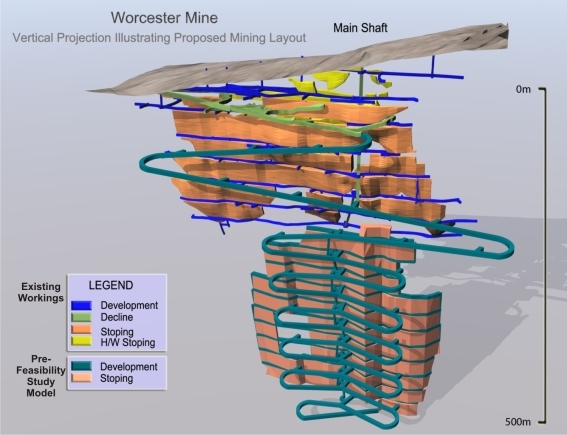 Instead, the exploration program in and around the Worcester Project area continues to concentrate on delineating additional Mineral Resources in an attempt to provide economies of scale to the project.